The four-chord AABA version of Pyramids is the basis of the Pyramids Concert Performance version we are working towards. The two-chord B section you learned in the previous lesson now needs to be expanded to a four-chord version. Here's the new music you'll learn. To expand the two-chord B section, we use the same method that we used to create the four-chord versions of Pyramids, starting on page 26. We put the right hand up an octave and the left hand down, leaving room for two more chords in the middle. The bars become twice as long. Note that you really have only two bars of music to learn. Even though the Fmaj7 and Emin7 chords have more complicated names, the hands still play basic root position triads (BMP chords). It is the single new melody note which makes the chord symbol more complicated. 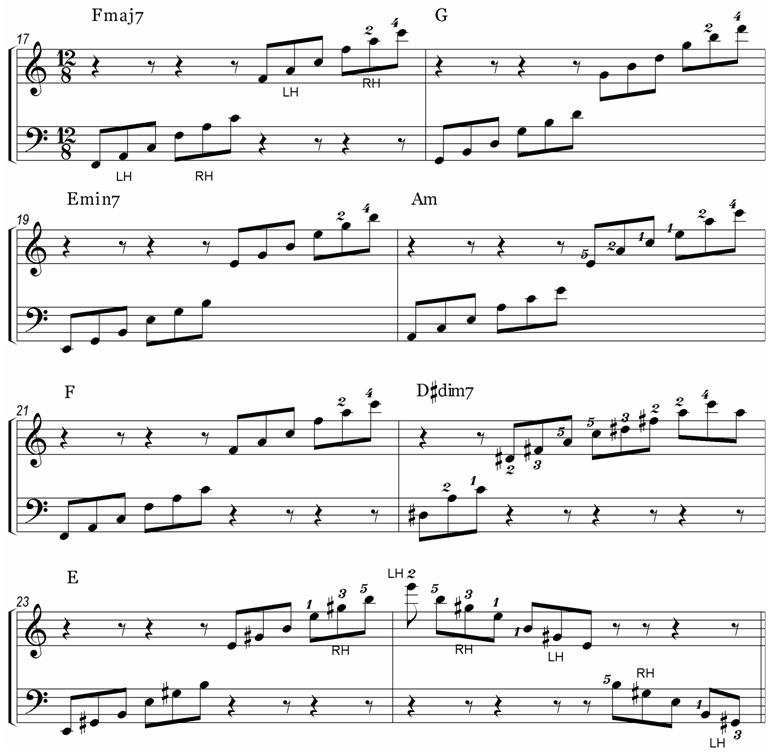 You have already played F, G and E minor four-chord patterns in the previous four-chord versions. Bars 23 and 24 are a left-hand-over pattern, which you have also played already. That covers six bars of the B section, leaving only the Am (A minor) and D sharp dim7 bars. Here are the A minor keys shown on the keyboard. Only the chord tones are shown – not all the ‘developed melody’ notes. 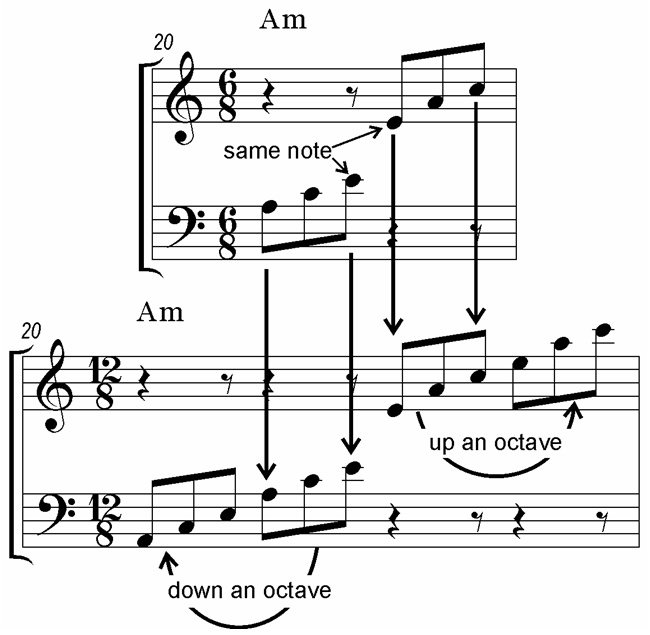 The two highest chords are inversions, not ordinary BMP chords. The D sharp dim 7 chord is not so straightforward. 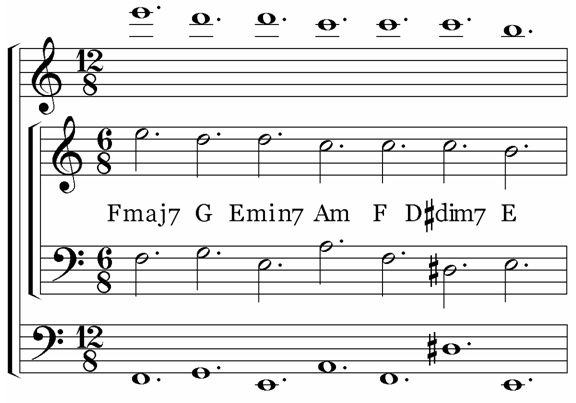 The four-chord D sharp dim 7 chord starts on the same note, but there are many more minor third jumps. 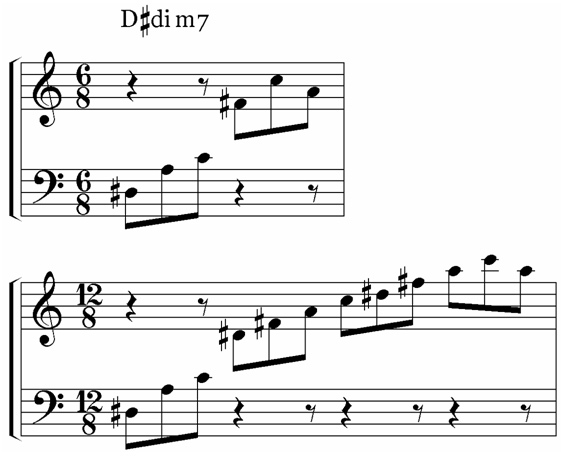 This is the music for both versions of the D#dim7 chord. Only the chord tones are shown - there is an in-between melody note as well. Now play just the chords of the B section on their own. You already have a zigzag line diagram for the B section, representing the melody and the line of the chord roots (the bass line). Play those zigzag melody and bass lines – the inside, six-eight music in the next diagram. Then move your right hand up an octave and your left hand down to play the new, twelve-eight music. Note that the D# (only) is the same note. Then play four three-note chords in between for each chord symbol. You can see all these helpful cues gathered together in a single cue-card in your Workbook. Here is the developed B section melody from the six-eight, two chord version. Note that lower-case letters (e, d, etc.) are used to indicate notes, not chords. For the four-chord version, you ‘stretch out’ the melody, an octave higher. Play the four-chord B section chords with the developed melody. Here is the MidiPiano/Piano Roll pane video. Here is the MidiPiano-with-scrolling-MS video. You now have everything you need to play an impressive four-chord AABA version of Pyramids. You have already played a 16-bar A1A2 four-chord version with developed melody. You have just learned the developed-melody four-chord B section (this lesson). You only have to play these sections in the A1-A1-B-A2 combination for an impressive Pyramids performance. 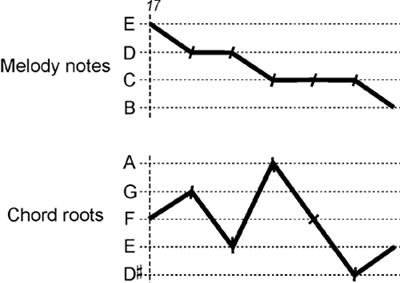 Use any of the AABA chord charts in previous lessons to guide your performance. Now go on to Lesson Eight.